TravelBook.ph was awarded Digital Marketer of the Year by Cebu Pacific’s Lifestyle Rewards Program GetGo during their second anniversary celebration last March 31, 2017 at the Blue Leaf Events Pavilion in Taguig. TravelBook.ph bested three other competent nominees including other travel service providers and banks. The Digital Marketer of the Year Award was judged based on the partner’s active participation in promoting the partnership’s proposition by creating effective contents using different relevant digital channels, not limited to SNS. As the future of travel gets more exciting with the continuous thrive of technology, these efforts to actively inject useful information and connect with members online definitely helps the journey of every traveller. TravelBook.ph has been a GetGo lifestyle partner since 2015 in accord with their objective to provide quality leisure services through traveling. In its campaigns, Travelbook.ph has created weekly features for GetGo that was featured in their website, newsletters, and official SNS. In connection to this press release, allow me to just share how stoked I am for finally giving in to partner my blog with a company that will be relatable to almost all of my readers. 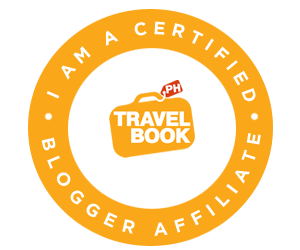 The Cynosure Blog is now an affiliate blogger of TravelBook.ph and I will be sharing you more about it. To make it even easier for you to look for your next staycation hotels, I've incorporated a "CHEAP HOTEL FINDS!" clickable on my navigation area located below the banner. The Digital Marketer of the Year award was received by Ms. Pinky Librada, Business Development Manager of Travelbook.ph. It was awarded by Mr. Michael Szucs, Chief Executive Adviser of Cebu Pacific, and Mr. Nik Laming, General Manager of GetGo’s Loyalty Division. TravelBook.ph is the leading online travel e-commerce company (online travel agent or OTA) in the Philippines dedicated to offering great value hotel bookings and with a varied selection of Philippine hotels and resorts in Baguio, Batangas, Bohol, Boracay, Cebu, Davao, Laguna, Metro Manila, Palawan, Pampanga, Tagaytay, Zambales, and more. A total of 3,200 affordable hotels are currently listed in TravelBook.ph. Travelbook.ph also offers exclusive reward points: Customers also automatically earn back 5% of the total amount they spend as reward points, which they can use to get discounts on their future bookings (1 point is equivalent to PHP 1.00). Customers can also use TravelBook.ph’s convenient mobile app to book accommodations on the go. It is available on the App Store and Google Play. S.E.A. 's Kitchen: Garden to Table Goodness!